Speaking of transit and Curitiba, it may also be of interest to those buying the general anti-government slant of this blog to describe the way Curitiba handled floodplain. Just north of downtown Sacramento lies North Natomas, a 20'-underwater-floodplain surrounded by weak levees, so unsuited for development that a grant to regional sewer said, in effect: "We know increasing your sewer capacity will lead to additional development, but if you develop in North Natomas, it'll cost you a $6 million penalty." The local land speculators didn't bat an eye. After they had bought or optioned many thousands of acres of farmland in North Natomas, they went all the way to then-vice-president George H.W. Bush and got that $6 million sewer grant penalty changed from one that was up-front to a pay-as-you-develop fee. And they got $43 million in federal levee improvement money -- enough to get the floodplain certified as buildable. Now that's a pretty good deal to begin with: Pay $6 on the installment plan to get $43! Where do I sign up?! Then the speculators got the City of Sacramento to annex North Natomas and approve development there. It was only after building had been going on for some time that Katrina occurred and the Corps of Engineers decided they'd need some levees that were better still. The bill coming due for the City and residents of North Natomas: $300 million and counting. Naturally, the speculators are long gone. They sold their land for literally 100 times what they paid for it. Since they undoubtedly 1031 exchanged out of the property, they did not pay even income tax on that 10,000% profit. Gosh, is this a subsidy? Ya think? That's how we handle floodplain in the U.S.-- we subsidize development on it outrageously as long as it profits some oligarch. I wish I was making it up. As much as possible, this method funnels the value of public development permission, into private profit rather than public service. Such scams are the stuff of David Cay Johnston's "Free Lunch: How the Wealthiest Americans Enrich Themselves at Government Expense (and Stick You with the Bill)." Three-quarters of George W. Bush's net worth comes from such a scam (with a stadium rather than floodplain). Mayor Lerner and his colleagues in City government discovered that development was moving toward their floodplain, so they bought the floodplain and made it into parkland. Consequently, Curitiba is among the world's leaders in per-capita parkland, and does not have expensive levees to maintain. But Curitiba is a third-world city, so it couldn't afford to mow all that new parkland. Enter the municipal sheep. Their wool supports children's programs. (No roving gangs of thugs plague Curitiba). Lerner's city continues to attract lots of jobs and business interest. He was re-elected by 90% pluralities, and went on to become governor of the Brazilian state, Parana. G.H.W. Bush went on to become president, but never achieved more than 50% of the vote and was defeated by Bill Clinton when he ran for a second term. The primary thing to note here is that collective action (government, public policy) can be intelligent, serve the public, and even more profitable for everyone than privatized profits for the speculators. Along those lines, it still amazes me that people want private pools (I have one! ouch!) -- shared, public pools are much cheaper and more fun for the kids too. So Warren and others can post these long arguments about how wonderful it would be to give everyone a Prius, but I can't help feeling this must be how it was for Galileo when he heard about the epicycles in the geocentric solar system. Even with all the complex justification, statistics and other misdirection, it turns out the argument that denies the very existence of the public realm and its possibility to empower everyone rather than the select few is baloney, when it's examined in light of what's possible with sharing. Now I don't doubt the auto/petroleum oligarchy will promote as much misinformation about this as possible (have you even heard of Curitiba? ), but simple truth still manages to beat such misinformation without breaking a sweat. Transit, when coupled with intelligent land use, can be much cheaper nearly as convenient. Incidentally, Sacramento published a study saying it would take $50 million just to connect all the disconnected sidewalks in the region's sprawl neighborhoods. Gosh, why aren't people walking to transit? Could it be the vehicle-ton-mile-equivalent to helicopters? See how the baloney works? Will H. weighs in with this: "Since you believe the current Iraq war is about oil then blame the war on those that stopped the development of domestic oil and energy." You go on, but don't mention what is by far the most abundant domestic energy source: conservation. To give you an idea of what's available, Europe and Japan produce first-world economies while consuming roughly half the energy per dollar of GDP of the U.S. So I'll take you at your word: I'll blame the people who stopped development of this abundant, clean source of energy: The Reaganites and their followers. They are directly responsible for rolling back the CAFE standards, for removing solar panels from the White House, and for continuing the U.S.'s dependence on foreign oil. Even now, we would get more energy sooner than ANWR by simply increasing fuel efficiency standards by 2MPG. The only difference: the oil in ANWR would eventually run out. The conservation never would. You would expect such an outcome from one of the most corrupt administrations ever, since they engaged in everything from illegal wars in Latin America, to illegally giving shoulder-fired anti-aircraft missiles to Iran. The Reagan administration was second only to Nixon's in indictments for malfeasance in office (29). Oddly enough the crooked, slick-Willie Clinton administration had zero such indictments. Hmmm. Could Clinton's criminality have been exaggerated? Gee, I wonder! Conservation is NOT an energy source. That's like saying not eating is a food source. Conservation doesn't produce one unit of work. If Clinton would not have vetoed the bill allowing drilling in ANWR the oil would be flowing now. Oil could flow within a year from the coast of California is the no drilling ban was lifted, the infrastructure is already in place. BTW I'm in favor of replacing OIL as transportation fuel with H2. Using electrolysis to produce the H2 at the fueling station you don't need refineries nor transportation to the fueling station, just water and electricity. H2 is also much safer than gasoline, H2 spill raises into the air and heads for the upper atmosphere where gasoline stays of the ground. H2 burns and at that burns up, gasoline explodes. To increase electricity to accommodate the electrolysis increase nuke and start developing Thorium reactor, must better than Uranium reactors. Thorium fission waste product is much safer and decay faster. I like the work being done on "plastic power" non silicon solar cells shows promise. But these technologies are not ready for prime time year although getting closer and even if they were really change the infrastructure can take decades. Also I like more geothermal usage from geothermal heat pumps to geothermal research plants being done in North Carolina. Oil will be needed for a while. Increasing the fuel efficiency 2mpg won't help me one bit today, I'm not in a market for a new car and buying a new car for just 2mpg is not cost effective for me. Next car I'll buy will be about 2012. You see I don't care what Japan and Europe has done, plus they aren't the number one economy in the world and they don't pay for their defense, we do. Europe was able to rebuild after WWII because of US military providing security while the Marshall plan provided the foundation of rebuilding. Both Europe and Japan depends upon the US military keeping the oil flowing from the Middle East and the US markets as a place to sell their goods. Japan economy would not be where it's at today if not for the US buying their cars and driving them. France old people die in the heat of summer because they don't have wide spread use of Air Conditioners. Conservation is NOT a formula for growth of the economy. Making thing more efficient is a good thing, give me a device that use less electricity I'm happier because it saves me money, but don't limit my growth. I use CFL at home to save money but I'll keep the air conditioner at a temp where I'm comfortable, I'm not going to line dry my clothes like my mother use to have to do in the wonderful 50's. BTW cars have become more efficient, 1969 I drove to California from PA in a 68 Impala, the mpg was 14.5 for the trip. In 2006 my wife and I drove to California from Ohio a total of 5000 miles with a 27.8 mpg and we didn't drive slow. (Faster than the Impala could do) The 06 fusion gets better mileage than any other car we even owned, better than the 74 Vega, 77 Nova, 70 Rabbit, 80 Chevette, 84 Golf all small cars, and the only car I had that was faster was a 95 5.0 Mustang GT. check out http://www.prorev.com/legacy.htm for details. Bloomberg does take the subway (occasionally). But when he does, he doesn't walk to the station near his house. He and his security entourage hop in the stretch SUV and they deposit him at a station 22 blocks from his house so that he can take an express train downtown. I'm not going to go so far as to call him a hypocrite, but it does send something of a mixed message to the New Yorkers he admonishes to be "green". LOL. I didn't know that part. Typical. production of transit presents an even weaker case. these places have very high incomes. such rent premia, why are the greedy developers not building them en masse. the same types of trends are playing out. Development does that. observed load factors that Brad Templeton referred to in his article. it as. In fact, some of the paint chips are starting to fall off. periphery. Even the transit mode share is dropping." declining. Development will do that. Not smart, not sustainable. And you thought your air quality was bad. urban rioting), but this is already a long post. twice...here's the keys to the car. These are interesting numbers, thanks for posting them. What they miss, I think, is that the city which is built by and for people using public transport is very different from that built for cars. The obvious numerical difference is that they are much more dense: if you spead NYC out enough that you could park in front of any store, and your office, and your home, then you'd have to drive an awful lot more miles between these places. Perhaps a better figure would be energy used per person, to cover the radius of a circle containing a million other people. For installing light rail in an existing, widely sprawled city, this would give the same answers as you get here. These statistics confirm a suspicion I have long held. Mostly empty, heavy mass transit vehicles, piloted on a fixed route, can't possibly energy efficient. No one climbs into a car and just drives in a congested city, aimlessly. "Mass Transit" does exactly that. It is a terrible investment, and not really energy efficient at all. The easy assumption of the urban planners that a compact city like New York is preferable to a post-auto low density city like LA or Phoenix, is not at all energy efficient. Put an equal number of people in a small area as in a less dense city, and you have the same tonnage of goods that must be brought in and, wastes carted out. If the transport net is congested, its more inefficient too. So whether Muhammad goes to the Mountain or the mountain is graded into a set of molehills, some of which are closer to Muhammad, the same amount of goods is brought in and brought out. So whether you have the population on a single island in Manhattan, or in 1600 Square Miles in Metro Phoenix, that same number of people need the same number of tons of food and fiber. The average Phoenician has a much more access to green plants, parkland, cleaner air, less congestion, a greener, healthier lifestyle, as proved by the inmigration statistics of people freely voting with their feet, too. It's all academic though. Real Mass transit, 21st century style will be patterned on the model that billionaires use. It is a limousine & chauffeur style Mass transit service. It takes you where you want to go, to the front door, not some parking space a mile from your destination. It leaves or waits, according to the situation, and returns to take you where you want to go, when you want to go. There weren't enough economical chauffeurs in the past to do this. Intelligent cars will do so in the future. Autonomous vehicles, in conjunction with as much cheap energy as any human will want, is coming despite Cassandra predictions of teh End of teh Gorean World. The present Energy price conundrum is a transitory, and almost concluded phenomenon. Lots of cheap energy is coming from fusion, nuclear, and conversion tot electricity, for most needs. It won't be oil-based, and human based, as before, but silicon intelligence, and electricity makes it all possible and predictable, for later in this century, if you don't have blinders on. Talk has covered energy costs of public transportation, the not-so-full public transports and the government, always the government, operating these public systems. I am here to tell you that none of the costs, none of the costs savings, and none of the environmental benefits of train, subway and bus transports make any difference. Everyone knows that taxpayer subsidy keeps those stinking buses and trains entangled in our daily commutes. 2003 Revenues were $6.7 million and expenses conveniently matched this number. Only $867K of the revenue stream came from fares, so the Taxpayers were left holding the bag for $5.8M. This give-away system that charged one dollar per ride had not increased fares in a dozen years. Passenger miles for the year were 5.5M so taxpayers were kicking in about one dollar per passenger mile. In his reply to my earlier post, Mike pays me the compliment of actually doing some research. Sure, it's not very much, and he misstates the conclusions from it, but thanks Mike! When are you publishing your training guide to the "Big Lie"? Mike first quibbles with my private pool v. public pool example. My point in mentioning these two types of swimming pools was that shared goods can potentially be preferred and cheaper -- just as fully-used mass transit may be preferrable because it burns roughly 1/8 the energy of single-occupant autos (this figure is from Roxanne Warren's book "The Urban Oasis", and is not, as opposed to many things Mike and his sources cite, something made up). My wife prefers it because she can doze or converse with her neighbors on the way to work. Nothing Mike says concerning private water parks or whether people can afford pools is germane, but something tells me that Mike gets a kind of pleasure in contradiction for its own sake. So if you want to be isolated and disempowered, Mike, we'll just have to play marco polo without you. Isolation and disempowerment, particularly of the pre- and the growing post-driving-age populations, is the undesirable side effect of sprawl, incidentally. If we're lucky enough to live long enough to be unable to drive, what are we going to do in sprawl, besides be warehoused, or simply disempowered when it comes to doing something outside the house? Incidentally, density is also not necessarily the antithesis of sprawl. See http://www.dpz.com, and click on "transect" for the illustration. MIKE! THE POINT IS HERE =>> It's cheaper, and often more fun to have a public pool, or just a shared private pool. The idea that all things exclusive, and private are preferred by humans is baloney. (I just wanted to make sure you get the point. No fair playing dumb.) Neighborhoods where people share the street with autos are healthier too (people walk), and safer, and cheaper, in the long run. And my point, still unaddressed, was that the original post is delusional in expect successful transit when the U.S. builds pedestrian-friendly, mixed-use neighborhoods that support transit 1/1500th as often as sprawl. Mike doubts land-use alone would produce successful transit, and discounts the success of Curitiba's transit too (my example of success). I never said the former, and can show Mike how he's bought a bunch of baloney for the latter. MIKE! THE BIGGER POINT IS HERE =>> When you build a society so averse to funding, or even thinking what would make intelligent, shared goods then you must ultimately expect to must defend yourself in your private compound against the invading Visigoths. If you don't get this, stop reading. Nothing else I say will make the slightest difference. So if you're still reading, Mike, virtually nothing you say about Curitiba's transit, or CNU is true. Here's from the Transportation Research Board at http://onlinepubs.trb.org/Onlinepubs/tcrp/tcrp90v1_cs/Curitiba.pdf, contradicting your conclusion that transit is failing in Curitiba: "Reports of the passenger volumes on the complete citywide system vary from about 1.9 million passengers trip per day (including transfers as two trips) to 2.1 million per day....There is no doubt that RIT ridership in Curitiba has increased since the initial stages of the scheme 30 or so years ago and continues to increase. .... RIT has maintained, if not increased, commuter mode share to transit at 70% to 75%, and there are no indications that this proportion is decreasing." So has government like Curitiba's "made a hash" of transit, as Mike asserts? Only if your hash is delicious and successful. Mike then asks: "if dense, walkable neighborhoods command such rent premia, why are the greedy developers not building them en masse[?]" Mike, if you ever try to do development, you'll discover that a) government, b) lenders, c) tenants, d) buyers e) private planners and f) builders all play a role in deciding how it's built. Finding people who know what they are doing to build something other than sprawl is not that easy, and getting them to all agree is doubly difficult. Furthermore, adopting, or rediscovering an idea unfamiliar to sprawl builders is not something often encouraged by these parties to the decision. Remember -- the risks are large, and nobody ever got fired for funding mediocrity if it's customary -- even if it fails. Lenders have been particularly intransigent, but government cluelessness, and commercial tenant demands are certainly factors. There are indications this is turning around, but the inertia alone is monumental. Meanwhile, the builders who have surmounted these obstacles, and have been building NU developments continue to charge - and get - premiums. Celebration Florida, Kentlands, MD, and Orenco Station in Oregon are a few examples besides Seaside, FL.. The idea that people prefer isolation is one of the underlying design principles of sprawl, but it does not sell as well as urbanism -- otherwise, Fifth Ave. apartments in NY City would be cheap. Yes, the Indians and Russians have started building sprawl, just as some teenagers have begun getting tatoos in their imitation of teen idols -- but should we call imitation sensible public policy? Isn't it really just another demonstration that because people have money to spend does not make them spend it intelligently. I believe "nouveau riche" was invented to describe just such people. On the other hand, I will admit that even though though you promote isolation and disempowerment, Mike, you have elected to use the Google provided by others. A first step in learning to share, I say. Mike found Professor Crane from UCLA who supposedly credits Curitiba Mayor Jaime Lerner's accomplishments as something that required a (U.S.-supported) Brazilian military dictatorship, even though his statement is contradicted by this: "According to Crane... "Lerner was effective mainly because he was a coalition builder, even when the system was not particularly democratic." (http://hundredyearshence.blogspot.com/2007/06/curitiba-v-bogota.html). But a dictator was nearby! Hey! When it wants to do public improvements, the supposedly dictatorial Curitiba's municipal government holds meetings with its constituents and offers them alternatives of equivalent cost: You can have this park, or we can pave that road, or... Then takes a vote of the neighborhood to decide what to do. Sorry, no reference here; I heard it from Lerner's mouth, and have no reason to doubt him. In my limited experience, few U.S. municipalities are this democratic. My local government either decides by fiat or in a process so obscure that discerning the costs and consequences of public policies is all but impossible. I've asked the locals for 20 years to tell me how much of their infrastructure costs for an average house are covered by building fees. Silence is all I've encountered. This would be germane if sprawl too didn't ignore a "host of historical and economic factors" that are orders of magnitude larger, like the $300 billion annual petroleum subsidy, the covert subsidy of streets designed to discourage pedestrians, loan underwriting that has short-changed compact development (in a very racist way, BTW) since the New Deal, etc. Meanwhile, the idea that such neighborhoods automatically produce good transit -- you know, the way the "invisible hand" of the market automatically produces good outcomes in the distribution of goods and services -- trivializes the argument altogether. Good mass transit - whether public or private - is impossible without pedestrian-friendly streets. How else are riders going to get to stops? Lack of sprawl is necessary. It's not sufficient. Mke asserts: "To be successful, fixed-route transit needs concentrations of activity at both the origin and destination locations. The elites at CNU conveniently forget this." But Mike, can't riders in a relatively inactive primarily residential area catch the bus to a more active area that is primarily shopping or offices, like my wife does? This just doesn't make sense, and ignores planner Robert Cervero's work about the success of transit and even neighborhood commerce in relatively un-dense (13du/acre) neighborhoods. Suburban densities of 1/6 acre lots word to make 13 du/acre, incidentally (5 large homes and an eight-plex on an acre). So Mike, you can find bad examples of government policies action everywhere. You can find similar ones for private institutions too (remember Enron?) It's not difficult. But finding government malfeasance is like shooting fish in a barrel -- heck, their meetings are public! We have to rely on Dilbert to keep us abreast of advances in stupidity in the private sector. That government is perfect was not my point. That it can potentially provide enlightened policy, as it unquestionably did in Curitiba was the point. To conclude that because "mode share is dropping" (from what? 80% to 75%? you don't say, and TRB says it's rising) it's a hash is throwing the baby out with the bath water. But what alternative do you propose? No public institutions or infrastructure? For example, do you really want the drug companies to vet their own medications? ("Here, have some Vioxx, it's perfectly safe!") Or do you prefer an agency supervise such things whose dealings are public, if not always honest? Requiring absolute honesty is typical right-wing baloney (like the contention that Clinton was crookeder than Reagan -- hilarious!). If it's a human enterprise, it has some dishonesty. Whether it is public, or private, it doesn't matter. BTW, the statement that Curitiba's transit makes money (i.e., is not subsidized) is Hawken's from "Natural Capitalism." Again, I was simply holding out the possibility that shared goods could be cheaper and preferred, even if not perfect. For you to quibble about whether they pay for the stops with the fares when 75% of trips occur on transit is beyond baloney. "To assume that this can be changed by giving the same people more control over urban land allocation strikes me as more than a little naive. Fool me once, shame on you. Fool me twice...here's the keys to the car." Your point is that somehow it's possible to live in isolation. By extension, you want to control your own transportation, food, clothing, medicine, contracts, security, etc., etc., etc. This is *really* throwing the baby out with the bath water. I'll agree that U.S. mass transit is crap -- it could be nothing else given the utterly hostile land-use patterns -- but what is this private policy that is so successful? Private auto ownership? That's crap too. The U.S. consumes roughly twice the energy of the Europeans and Japanese per dollar of GDP primarily because autos are such inefficient means of transportation. I should also add that sprawl requires every driving age adult own an auto, so it is one of the cruelest, most regressive of taxes. Incidentally, professor Crane, Mike's authority, also asserts that "I do not really know much about [Bogota or Curitiba] and hope the accidental reader can offer useful comparative information" posted here http://postcarboncities.net/node/411. Sorry for the lengthy reply, but it's obvious to me that Mike knows nothing about Curitiba and is hoping that the big lie ("only 75% of transportation is on transit that is self-sufficient, not subisidized -- therefore Curitiba transit is a hash") will pass muster. It's just a big lie, Mike. Many tyrants have used it before you, but it ain't convincin' me. who the hell knew Brad Templeton was still alive? Still waiting you to explain what the "Big Lie" is. You misinterpreted my comment about the swimming pool. My point is that is that public provision is not required for many types of shared goods. The concept of community implies some set of shared values. Cities are typically too large and heterogeneous to function as real 'communities'. They should focus on pure public goods (e.g. safety, local street and parks) and forget about providing niceties like swimming pools. If you want to take your kids to a public pool, bully for you. But to suggest that we ought to the same, or that we should pay for it, well that's just unfair. I have not read "The Urban Oasis", but I'm guessing its content tends more toward the popular than the academic, since it repeats the oft-cited claim about full buses being more energy efficient than auto travel. This claim is irrelevant, since full transit vehicles are rarely observed. Public transit agencies try to be all things to all people (reduce congestion, reduce pollution, mobilize the poor, end climate change, command the tides, etc. ), and end up being nothing to everyone. 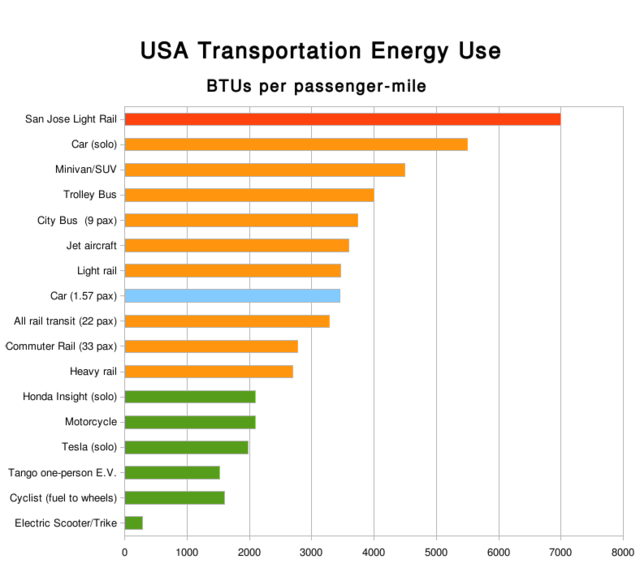 This is borne out by actual observed load factors and the DoE energy consumption comparisons. The doom-and-gloom predictions about the elderly being immobile are similarly unlikely. Wiliam Black has shown, using national data from the U.S., that the elderly are not only not using public transit in disproportionate numbers, but that they are also driving longer than they used to. Increasing life expectancy is a beautiful thing. The more likely outcome, which I have observed, is that transportation service will become packaged with senior housing. The housing providers also provide local shuttle bus service for residents to make trips for shopping, medical or other purposes. Not only does this better meet the needs of the elderly, it cuts down on the wasted effort involve with providing fixed-route services. "Transects" are merely the latest design fad among landscape architects and land use planners. Functionally, they are no different from the "dense, walkable" city framework that Smart Growthers and CNU types have been pushing for years now. When Andres Duany, Peter Calthorpe and the rest of the flat-earth society start providing serious empirical research on the travel behavior effects of these types of development, I will start taking them seriously. The point is that dense neighborhoods are safer, cheaper, healtier, etc.? Go ahead and provide some evidence when you feel like it. My point is that people can very often find better prospects in goods provided in the private sector (when they are allowed to), making heavy reliance on government unnecessary. The TCRP report you cite is now 5 years old. The NYT article identified by Randy Crane was from 2006. What happened in the intervening years? Brazil has been developing economically, and in socities where such activities are not forbidden, this means greater auto ownership and land consumption. It is entirely plausible that transit use is declining in Curitiba. In 1984, Peter Gordon and Richard Willson published a paper on the determinants of light rail transit demand. It used a cross-sectional data set from around the world to estimated LRT demand, though it could just as easily be applied to other rail or bus rapid transit systems. The relevant factors were the usual culprits: per capita income and auto ownership, urban densities, station spacing, and a dummy variable to identify cities in socialist countries, indicating that cities have land markets that are either non-existent or have limited function. This model should predict demand in Curitiba quite well. Incomes are low, which is related to low auto ownership levels. Densities are also rather high, but this is largely a function of highly restrictive land use policies, which justify adding the effect of the dummy variable for socialist cities. However, the model is cross-sectional. Urban change is a process through time. We will have to study this example for several years to see of the predictions are borne out. But the evidence seems to be starting to appear already. As reported, transit ridership is starting to fall, which could easily be explained by rising incomes. I will also look for data on auto ownership levels, though this is typically only available at the national level. My point is that Curitiba is not really all that exceptional. Like many low-income cities, public transit is still heavily used. Yet the historical evidence on development and urban change suggests that if Brazil is economically successful, not only will transit use decline, but citizens will seek to throw off the shackles of land regulation and demand the opportunity to engage in private land tenure. Here's a thought or two to mull over lunch :). What kind of a system survives damage better, a decentralized one or a centralized one? If you had to evacuate a city, what kind of a system would be better able to handle the job, a centralized one running on a fixed track, a centralized one running on a decentralized track/road network, or a decentralized one running on a decentralized track/road network? Whenever these kinds of projects get debated, no one seems to consider disaster planning. If you needed to evacuate New York City from a Cat-3 hurricane in less than 72 hours (and New York City, particularly Long Island has been hit several times by strong hurricanes in the last 150 to 200 years) today, what do you think the result would be? Would it look like New Orleans and Katrina? You tell a half truth in saying this article claims Curitiba's transit rideshare has declined since the TRB study I cited previously. You remember, that older TRB study said Curitiba's unsubsidized transit, provided 1.9 to 2.1 million trips daily, had been getting increasing rideshare for 30 years, and captured 70 - 75% of all trips. Your NY Times article citation adds later stats: "When the bus system was inaugurated, it transported 54,000 passengers daily. That number has ballooned to 2.3 million, in large part because of innovations that permit passengers to board and exit rapidly." The NY Times article you cite does say transit is not gaining rideshare, but that's because "The bus system that has won admirers throughout the world appears to be nearing capacity." Not because a hash was made by government; because it's too successful. In jumping from "Curitiba has fewer trips in transit since 2005" despite an increase in the absolute number of trips, to "government makes a hash of everything" to "let's just discard government altogether, allowing it to make parks, but not pools" the bizarre distortions just grow. All of these figures are, BTW, astonishing in comparison to the third-rate crap that is U.S. transit, even if I cannot tell you whether this is ordinary for the third world. (Google is no help here.) My understanding is that it's extraordinary even for Brazil (Brasilia was built for autos, for one example). Many others posting here appear to be willing to dismiss transit as unworkable because U.S. transit is bad, too -- but the Curitiba experience is *different* despite your misdirection. Oh yes, and let's not forget that Curitiba got all this for 1/100th of the cost of the subway originally proposed by the U.S.-supported dictatorship, and the administration responsible got re-elected by large pluralities even after the dictators were gone. More lies: One of your initial post's concluding remarks says: "To assume that [the "hash" of transit and land use] can be changed by giving the same people more control over urban land allocation strikes me as more than a little naive." I never said give the same people more control. I explicitly said that current U.S. transit / land-use policy is crap, and I want to give *different* people charge of such policy -- preferably people who would seek informed consent from the public for any transit decisions -- including allowing the public to know about the possibility of successful transit like Curitiba's. This would include letting the public know about peak oil, and offering to have a diversified portfolio of transit options rather than the economically vulnerable auto monoculture covertly subsidized by building only sprawl. You know, real conservatism. Interestingly, cdquarles, one of the government-can't-do-anything-right crowd follows your last answer with a post about how centralized transit systems might break down if a disaster -- say Katrina -- occurred. I can think of no better way to describe W's response to that disaster in New Orleans, incidentally -- a breakdown. Herbert Hoover had a similar New Orleans disaster in 1927, and he managed to do better than W, with just one caveat. He was using horses and buggies. So different people, please! For the last 30 years, with little respite, the U.S. has had Reagan and his acolytes, the government-can't-do-anything-right crowd, in power. These are people who believe government is the problem, and set out to demonstrate just how big a problem it can be. An implied untruth in your posts is that there's some viable alternative preferred by the market. The market discounts real estate in transit-obstacle sprawl, and pays premiums for transit-friendly New Urbanist neighborhoods, even if no transit is currently available. This isn't just my opinion; I've cited the comparable sales. Sprawl cities' developments are so unpopular that they regularly produce anti-growth movements. Even the "un-planned" city of Houston still builds god-awful sprawl because it has sprawl street design standards. In other words, the "un-planned" stuff still has to have some rudimentary public policy about which most of the public is unaware. Even the lack of public policy is a kind of public policy, and produces Houston, which is to say crap (no offense to crap). The truth is that pedestrian- and transit-friendly New Urbanist codes empower the public, are far simpler and more understandable than the sprawl zoning. Sprawl planning (from the *same* people)truly requires an elite to interpret and profits the usual oligarchs at the expense of the public realm -- significantly the auto dealers who now have entire populations that cannot get around without autos. New Urbanist codes produce something the market likes just fine. Calling the New Urbanists names ("elites") is just a lie *and* a distraction. The "Big Lie" all through this blog is that government can never set a foot right, and private decisions are always best because the tooth fairy...er, I mean the "invisible hand," will make everything jake. I'm not saying the market doesn't allocate resources efficiently, I'm saying it's as likely to require referees as any game in town -- and public referees exceed the disclosure required by private ones. There will be referees regardless of what is chosen, public or private, and to pretend otherwise is to begin to leave the world of lies and enter the world of delusion. - Pre-Reagan, the U.S. was the world's largest creditor nation; after, the world's largest debtor. - Pre-Reagan, the U.S. had a trade surplus; after, a trade deficit. - Despite his anti-government line, Reagan grew the government (as did W), and left a debt larger than all previous administrations combined. - Pre-Reagan (especially pre-1973 oil shock), real median wages were rising; in the 30 years after, real median wages remained relatively flat while the top 0.01% of income earners got a 497% raise. - Pre-Reagan (actually pre-1973) the U.S. economy's growth was roughly 4%, after, roughly 3%, despite all of the miraculous results tax cuts were supposed to produce. - Pre-Reagan, Savings & Loans were failing; after, the Reagan / Bush method for handling this business failure produced the largest public political and financial scandal in U.S. history. Notice that the Clinton raised the top income taax brackets, and contrary to the Reaganites and supply-side witch doctors... er, I mean voodoo economists' assertions that this would lead to economic meltdown, produced many more jobs. Sprawl is the growth pattern for the let's-pretend-there's-no-such-thing-as-intelligent-public-policy crowd, and like sprawl, the promotion of isolation and disempowerment is also a constant theme in this blog. Sneering at the public realm, and the government that manages it is condoned and encouraged. The idea that a policeman or soldier might put his or her life on the line to defend your little private compound from the invading Visigoths... well, that's kind of ignored. The fellow-feeling that keeps your suppliers from poisoning your food or medicine not vetted by the FDA or the agriculture dept..... not much encouraged. Any reminder that collective action can profit anyone, ever, is vigorously denied, even at the expense of the truth. The U.S. government has seldom been perfect, but it has been very helpful to its citizens, providing everything from farm-to-market roads, to interstate highways, to silicon chips (yes, Fairchild conductor built them, but for the *government* first), to the internet. This government-can't-do-anything-right sentiment is the soft bigotry of low expectations applied to the public realm. It is well-funded and promoted by those oligarchs who have profited mightily from it (497% raise!). The originating post says transit in the U.S. is crap -- something I didn't dispute -- but Curitiba, and other locations (San Francisco, London, Paris) prove it can be done well, even making roads less congested so private auto drivers have an easier time. Curitiba proves it can be done well on even a third-world budget. Nothing you've said or cited contradicts the idea that public policy can be done well (and complaining about the left cheek of transit while the right cheek of land use is not mentioned -- well, that's just half-assed). Mike says: "Cities ... should focus on pure public goods (e.g. safety, local street and parks) and forget about providing niceties like swimming pools. If you want to take your kids to a public pool, bully for you. But to suggest that we ought to the same, or that we should pay for it, well that's just unfair." Mike this is exactly what sparked the Civil War -- no not slavery, but whether the majority gets to decide public policy. That's "settled science" for reals. Personally, I think you are pretty arbitrary when you say cities can manage parks, but not public pools. What makes you draw the line there? And I won't dispute your contention that "Cities are large and heterogeneous...not communities" remark. All the more reasons to build neighborhoods that encourage community and personal encounter rather than sprawl. Sprawl is *anti-*neighborhood and anti-community because it isolates people, maximizing privacy, but providing nothing like the public realm required for a social encounter, much less something that could be considered community-promoting. "Transects" are so far from a fad that they actually describe city building from its inception. But I'm guessing that's not convincing to a fellow who despairs that Curitiba has blown it with its outrageously successful transit system. Safer: Per-capita crime is lower in high-density New York City than in, say, sprawl-oriented Phoenix, or Sacramento. I leave it to you to google the stats. Cheaper: There's no difference in the cost to build sprawl v. pedestrian-friendly mixed use, says Randall Shaber, the project manager for Laguna West (Peter Calthorpe's new urbanist subdivision south of Sacramento that has since been rezoned by clueless policy makers to be sprawl). And both commute costs and environmental impacts are lower when people have an alternative to driving. Anyway, this is a long reply, but Mike I felt that even though you appear more interested in deception and winning the argument at all costs than in the truth of the matter, anyone who does research on this blog deserves a little attention. Now, if you can just give up the delusional thinking, we can discuss what public policy ought to be for reals.